I’ve been loving the spring weather this week. All the snow is gone and the temps have been warm enough for me to run in a tee. Mike and I are hoping to take advantage of this weather by going on a nice, long hike and with the pups this weekend and then grilling out after. Fingers crossed that the forecast is wrong and that it doesn’t rain! This pineapple salsa is sweet with the perfect amount of heat. It’s super versatile, too. I ate it with chicken, with pretzel thins, and even just straight-up with a spoon. 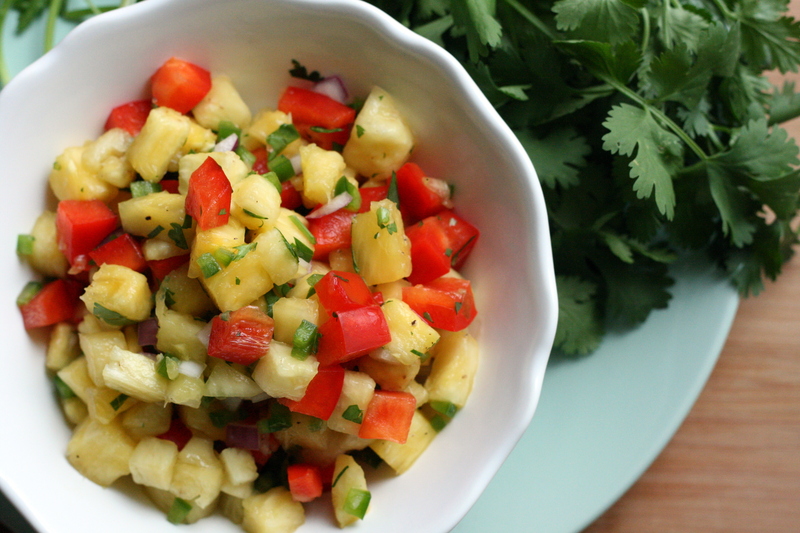 In a large nonreactive bowl, stir together pineapple, onion, bell pepper, jalapeno, lime juice and cilantro. Season with salt and pepper. Categories: Appetizers & Snacks, Dairy Free, Gluten Free, Money Matters, Quick & Easy, Side Dishes, Special Diets, Vegetarian & Vegan | Tags: appetizer, dairy free, dip, gluten free, side dish, vegan | Permalink. I’m so hungry… Ooh! I have Brussels sprouts at home! These Brussels sprouts are dangerously addictive. Even Mike, who doesn’t really care for Brussels sprouts, gobbled these up happily. He has actually been requesting roasted Brussels sprouts for the last couple weeks. I think we’re averaging 2 – 3 pounds of Brussels sprouts per week right now! This recipe is a good reminder that good food doesn’t have to be complicated. It’s four ingredients: Brussels sprouts, olive oil, salt, and pepper. I still can’t get over how simple and delicious these are. Preheat oven to 400°F. 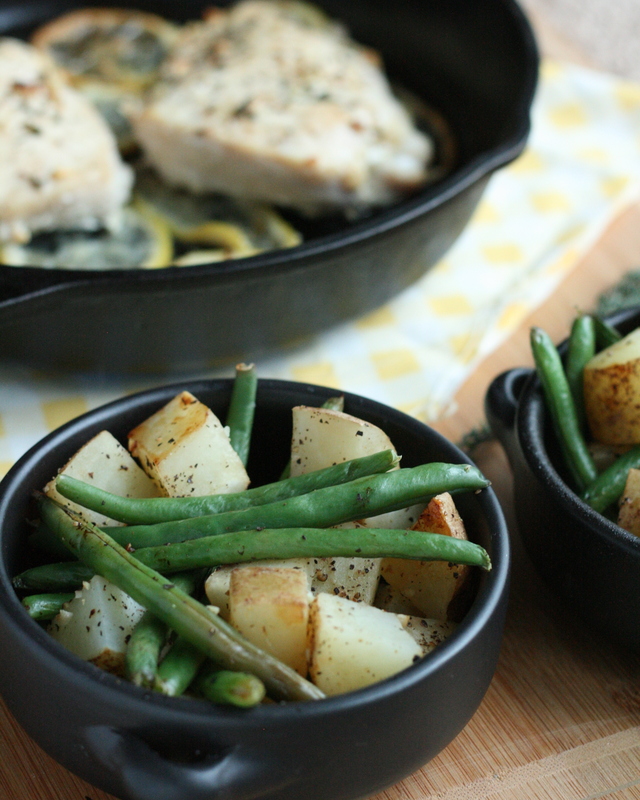 Spray a baking pan with olive oil and set aside. Cut off the end of the Brussels sprouts. Cut Brussels sprouts in half and remove any discolored outer leaves. 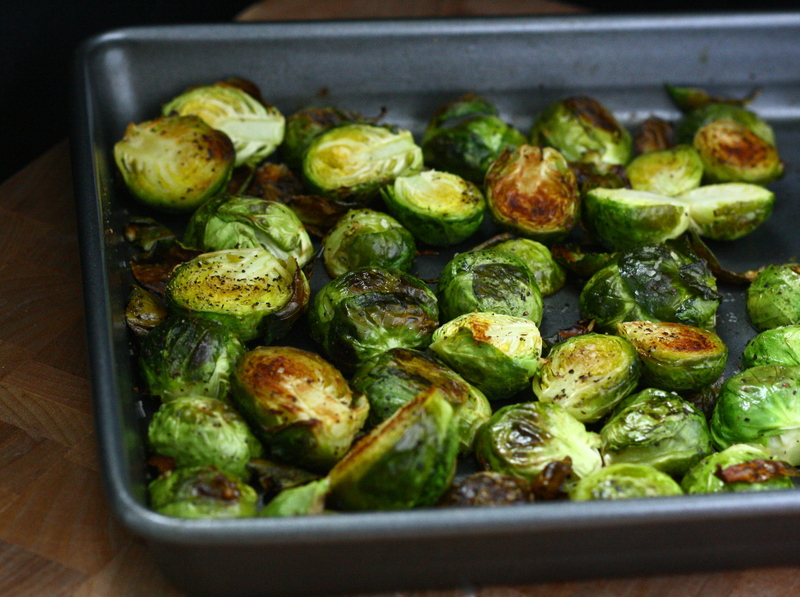 Place Brussels sprouts in prepared baking pan and spray with olive oil. Sprinkle on salt and pepper and stir to coat. Bake in preheated oven for 20 – 25 minutes, stirring once or twice. 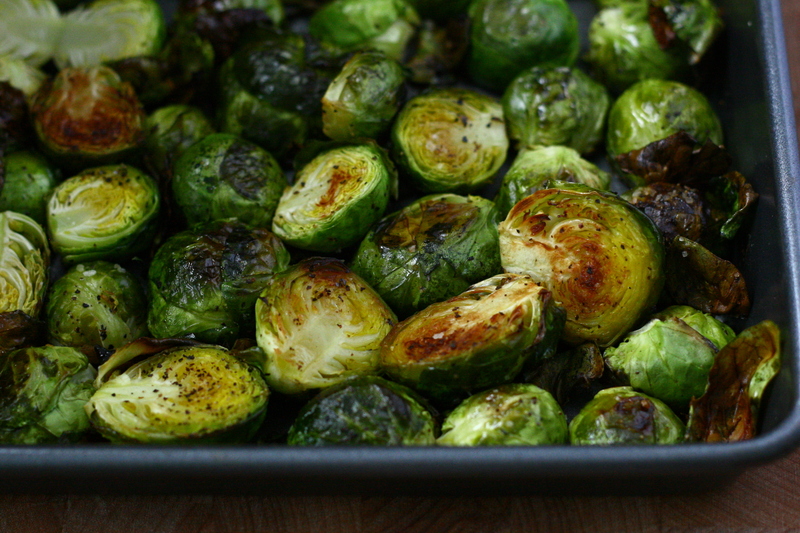 Brussels sprouts are done when lightly browned. Season with more salt and pepper to taste before serving. Categories: Dairy Free, Gluten Free, Money Matters, Quick & Easy, Side Dishes, Special Diets, Vegetarian & Vegan | Tags: dairy free, gluten free, side dish, vegan, vegetables, vegetarian | Permalink. 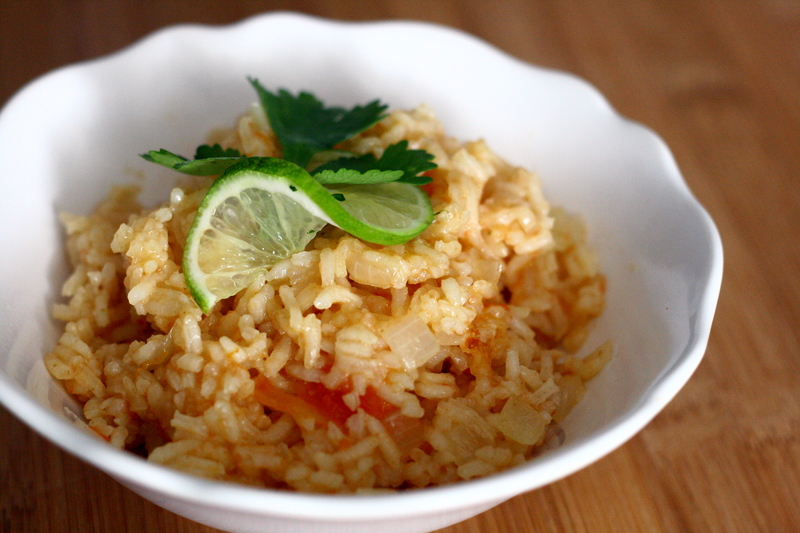 I whipped up a batch of this rice to go with the chicken enchiladas I made for Mike. Because, you know, a carb-heavy entree needs a carb-heavy side dish to go with it. Ok, truth is, I made this rice because the enchiladas smelled so good and I couldn’t eat them. So I made a bunch of rice and ate that instead. Now, this rice is obviously not the same as a chicken enchilada, but it was enough to satisfy my craving. This is my favorite go-to recipe for a quick and easy dish to accompany any Mexican-inspired entree that might find its way onto our table. Heat oil in a large saucepan over medium-high heat. Add rice and cook, stirring constantly, until rice is lightly toasted. Sprinkle with garlic powder and cumin and stir to combine. Add in onion, garlic, and jalapenos and cook, stirring occasionally, until onions are translucent. Stir in diced tomatoes and broth and bring mixture to a boil. Reduce to a simmer, cover, and let cook for 20 – 25 minutes or until rice is fully cooked. Fluff with a fork before serving. Garnish with chopped cilantro and a lime wedge if desired. Categories: Dairy Free, Gluten Free, Money Matters, Quick & Easy, Rice, Side Dishes, Special Diets, Vegetarian & Vegan | Tags: dairy free, gluten free, quick and easy, side dish | Permalink. I’ve been hunting for quinoa dishes ever since my co-worker picked up the world’s largest bag of quinoa from Costco for me. I’ve come across some seriously drool-worthy dishes laden with cheese and other delicious dairy-ness. While I’ve been able to introduce dairy back into my diet with some success, I’m still wary – one bite too many is bad news. 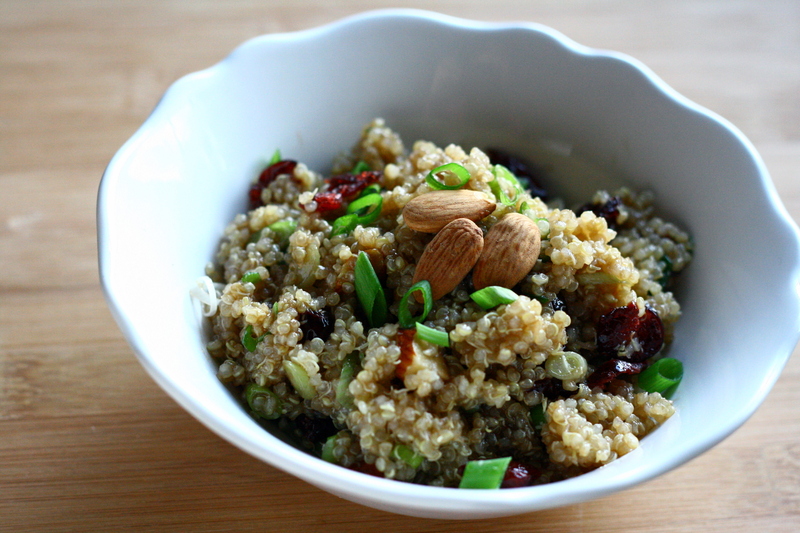 Fortunately, this super easy maple balsamic quinoa salad is 100% dairy-free. As an added bonus, the ingredients in the recipe are fridge and pantry staples for me. I found the original dressing proportions of oil, vinegar and syrup to be way too sweet, so I decreased the amount of syrup and oil. If you prefer a sweeter dressing, use a 1:1 ratio of oil, vinegar and syrup. Cook quinoa according to package directions. Refrigerate until completely cooled, stirring occasionally. Meanwhile, prepared the dressing by whisking oil, vinegar and maple syrup together in a small bowl. Add dressing to the cooled quinoa. Stir in cranberries, pecans, scallions and salt until well combined. Refrigerate at least 1 hour, preferably overnight. Serve cold or at room temperature. Categories: Dairy Free, Gluten Free, Main Entrees, Quick & Easy, Side Dishes, Special Diets, Vegetarian & Vegan | Tags: dairy free, gluten free, quick and easy, side dish | Permalink. Ok, so there isn’t any “L” in this BLT salad. It should probably be called BKT or BKaleT. As it turns out, raw kale isn’t really my jam. It tastes like what I think grass might taste like. But, raw kale covered in dressing with bacon? Right up my alley. Wash and dry kale. Remove the stem from each leaf with a pair of scissors, a knife, or your fingers. Stack leaves on top of each other and slice into thin strips. 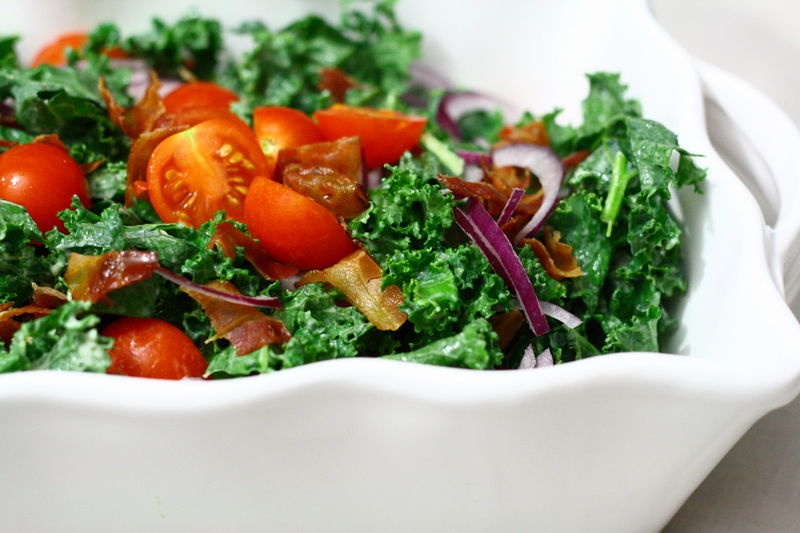 Place kale strips into a large bowl and toss with bacon, cherry tomatoes, and red onion. To make the dressing, whisk all ingredients together. Pour over salad and toss to coat. Serve immediately or refrigerate until serving. Categories: Dairy Free, Gluten Free, Main Entrees, Meat, Pork, Quick & Easy, Salad, Side Dishes, Special Diets | Tags: dairy free, gluten free, main dish, quick and easy, side dish | Permalink. Summer means shorter work hours for me, but for some reason I’m finding myself less and less motivated to make elaborate meals. Maybe it’s the heat. Maybe the shorter work weeks make me lazy. Maybe it’s Summer Brain. 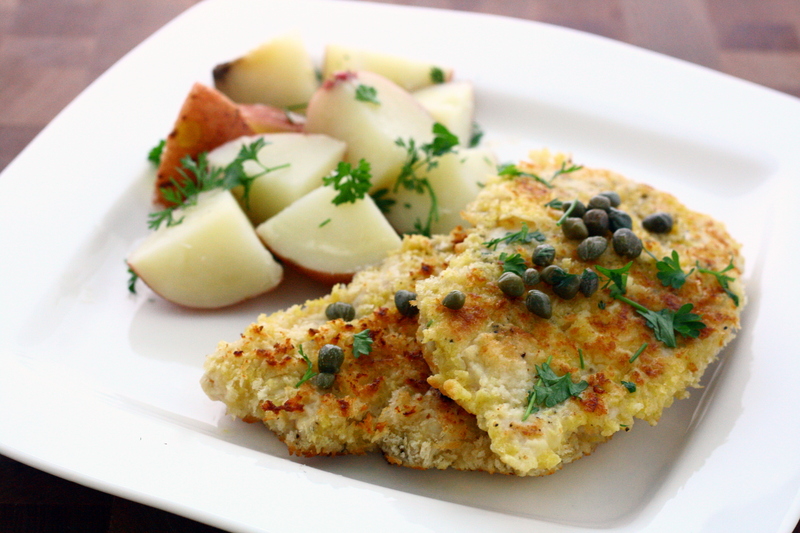 To make the chicken, place the flour, eggs, and panko in three separate shallow dishes. Mix in 1 teaspoon of salt and 1 teaspoon of pepper into the flour mixture. Season the chicken with salt and pepper. Dredge chicken in flour and shake off excess. Dip into egg and then coat with panko, using your hands to gently press the panko to the chicken. Heat canola oil in a large skillet over medium-high heat. Add chicken and cook until golden and crispy, about 3 – 4 minutes each side. Meanwhile, melt butter in a small saucepan over medium heat until lightly browned. Add in chicken broth, capers, and lemon juice. Spoon over chicken and sprinkle with parsley before serving. To make the potatoes, place potatoes in a medium saucepan and cover with water. Bring to a boil, reduce heat to a simmer, and cook until potatoes are tender, about 15 minutes. Stir in butter, lemon juice, parsley, salt, and pepper. Toss gently until potatoes are coated evenly. Categories: Chicken, Main Entrees, Meat, Side Dishes | Tags: chicken, lemon, main dish, meat, potato, side dish, vegetables | Permalink.